THE first maiden speech by someone representing Hampstead in more than 20 years was worthy reason to spend the day at the Commons last week. Here’s how Tulip Siddiq’s duck-breaking went, as published in the CNJ. IT was Alex Salmond who kept the prime minister of Bangladesh waiting, although he may not have realised it as he argued on and on about how Scotland should fit into the handling of the European referendum. Ironically, as a public gallery stacked with faces from another continent waited for Tulip Siddiq to rise to her feet in the House of Commons for her maiden speech on Tuesday afternoon, Mr Salmond could be found delaying the moment with a to-and-fro with who else but Chris Philp – an MP who just like Ms Siddiq once operated in the somewhat smaller theatre of Camden council politics. 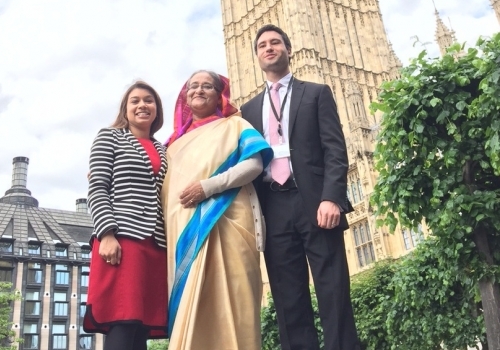 Bangladesh’s ruler Sheikh Hasina, Ms Siddiq’s aunt, waited in a more secure section in the gallery, with the new Hampstead and Kilburn MP’s mother, Rehana, her husband and in-laws. What must they have thought of the cocksure former SNP leader as he revelled in centre stage, looking for all the world as if he could talk for the rest of the afternoon? This house is but the smallest of worlds: Mr Philp entered Parliament last month too, as the comeback kid elected in south London after famously missing out in Hampstead and Kilburn by just 42 votes in 2010. The gallery continued to fill in expectation, dazed schoolchildren on day trips next to close followers of Bangladeshi politics. A member of the Hasina’s security team, wearing military uniform, looked unimpressed when he was asked to remove his peaked hat by a hardline usher. Rules are rules. The tradition is for new MPs to break their ducks quickly after reaching Westminster, meaning that, as she waited for her extended family to be there, Ms Siddiq was one of the last of the new school to make her maiden speech. Security around the Bangladeshi leader is always tight. Ms Siddiq’s mother and aunt were the two survivors – by the fortune of being on holiday – of an attack which killed 19 members of the family in a bloody coup in 1975. Rehana later sought asylum in London while Hasina returned to the country in 1981. It was this story which the constituency’s victor at the general election on May 7 would re-tell when Salmond finally relinquished the floor, and she was able to speak. Ms Siddiq said she wanted to recount her family history because it fitted into her plea for the importance of migration to be recognised, although she has been adamant in the past that she does not want to be judged on Hasina’s choices. Her regime can be divisive in Bangladesh and among London’s Bengali communities. While rivals suggested she was keeping quiet about her lofty family relations during her journey to this milestone speech for fear of being seen as part of an elite, Ms Siddiq maintained she wanted to be judged on her own merits. Beside Ms Siddiq sat fellow Camden newbie Keir Starmer and Stella Creasy, the Walthamstow MP looking to become the party’s deputy leader. There were healthy back-pats too from Wes Streeting, Rushanara Ali and Stephen Kinnock. While the speech was about immigration and the EU referendum, these occasions are meant as a moment to showcase the constituency and pay tribute to those in whose footsteps she follows. There were a succession of film title puns about the retiring Glenda Jackson, “a woman in love with social justice”. Her comrades honked with laughter in all the right places, including when she joked about how any political leaders would be welcome to walk across the Heath. Although Michael Foot once roamed these fields with his dog Dizzy, it was a reference to Ed Miliband’s last conference speech as leader, which hinged on curious references to people he spoke to during a stroll across the sprawling green space. On this day of arrival for Ms Siddiq, Mr Miliband was actually outside, giving a tour of the parliamentary estate to schoolchildren. He gave a grin to her aides when they walked out later, and sent a congratulatory text. Perhaps more touching than a laugh-a-long tribute to Ms Jackson was the time Ms Siddiq took to remember Ben Whitaker, who served one term for Labour in the constituency in the 1960s as control see-sawed between the two main parties. He passed away last year. She celebrated Hampstead and Kilburn as the country’s most radical constituency, name-checking George Orwell and birth control pioneer Marie Stopes. Then, rather than name some of the same old celebs of present-day Hampstead, she celebrated the area for nurturing writer Zadie Smith, comedians Mitchell and Webb and Sir Bradley Wiggins. Let’s face it, she had a list to choose from, although whether the Olympic medal-winning cyclist, usually down in record books as hailing from Maida Vale, can really be selected as one-up for Hampstead and Kilburn was glossed over. “I do not believe any other constituency has the radical background we have in the arts, social awareness, politics, architecture and poetry,” she said. In nine minutes it was over. Nine minutes, which her new colleagues noted were delivered without notes, a trick she is used to. “She didn’t forget anything important,” said an aide, another laugh about Mr Miliband’s brain-fade moment at conference when he left the economy out of his keynote speech. As she walked to the riverside terrace, her shoulder pads cut so sharply she could have collected pint glasses on them, MPs in every corridor remarked on that. No notes, amazing, they cried, no notes. Conservative Liam Fox was one who offered profuse praise as they reached the restaurant where relatives stayed on for selfies and a salmon lunch.